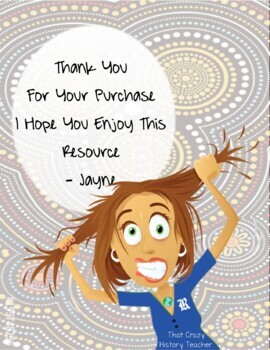 This is a wonderful resource for any Social Studies classroom. It covers the Georgia standard SS6H4: Explain the impact of English colonization on current Aboriginal basic rights, health, literacy, and language. It can also be used in an art, sociology or English class. I created this station activity for my own social studies classroom. Our district is focusing on incorporating literacy standards in all subject areas. This is a great way to get students reading for information. 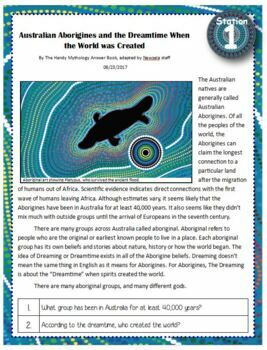 To complete this activity, students work in groups of 2 or 3 and rotate through 9 stations answering questions about aboriginal dreamtime, aboriginal art, dreamtime stories, and symbolism in aboriginal art. 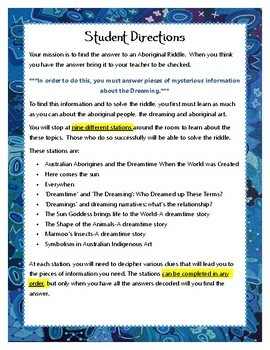 After answering these questions they should be able to figure out the answer to an aboriginal riddle. My students love this activity. I hope yours do too!